Urinary stones are clusters of mineral crystals in the urinary tract. 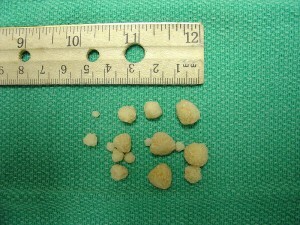 They’re often called bladder stones because 85% of dog and cat urinary stones are in the bladder. Veterinarians and researchers also refer to them as uroliths or cystic calculi. Struvite stones. Photo courtesy of Joel Mills. Excess minerals in the urine: magnesium, phosphorous, calcium, or ammonia. Urinary pH being too acidic or too alkaline. Diseases that cause high levels of calcium in the blood. Liver shunts (also known as portosystemic shunts). Medications that increase mineral levels in urine or alter urine pH. The most common such medications are: cortisone, Lasix, ascorbic acid (vitamin C), sulfa medications, and tetracyclines. Calcium oxalate stones. Photo courtesy of Joel Mills. Some dog breeds are more prone to uroliths than others: Miniature Schnauzer, Yorkshire Terrier, Bichon Frise, Miniature Poodle, Cocker Spaniel, English Bulldog, Lhasa Apso, Cairn Terrier, Shih Tzu, Dalmatian, and Dachshund. Cat breeds that are more prone to uroliths are ragdoll, Chartreux, oriental shorthair, and Himalayan. What are the symptoms of urinary stones? Sometimes animals with urinary crystals have no obvious symptoms. 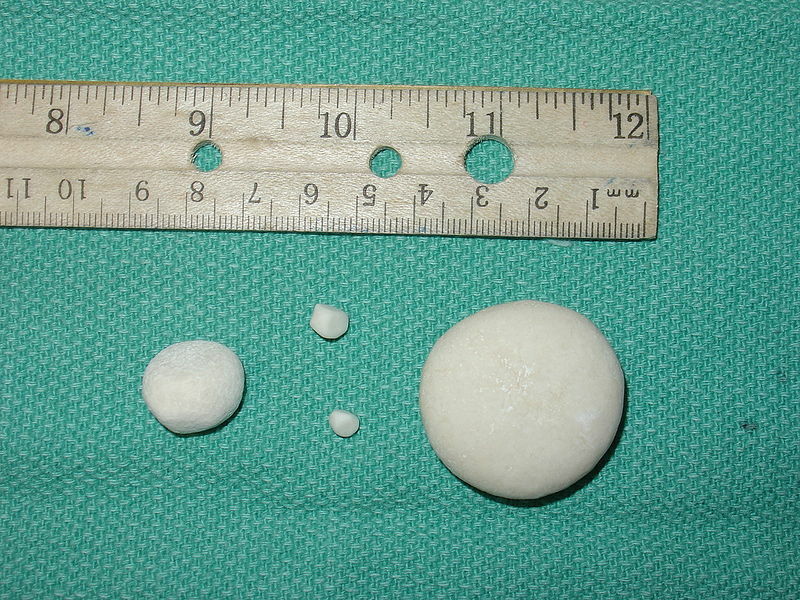 In these cases, uroliths are discovered during routine physical exams when a veterinarian feels the stones in the urinary tract. Just another reason to make sure your pets have annual physical exams. The primary problem caused by urinary stones is blocking the flow of urine, with problems that range from mild discomfort to life-threatening. This is why it’s so important to observe your companion’s behavior when “doing his business”. Not paying attention has a major consequences. Urinating small amounts frequently (pollakiuria). Blood in the urine (hematuria). Excessive licking of genital area. Decreased appetite that can lead to lethargy. Pain that can lead to a reluctance to jump or play. Pain can also cause dogs to pace or to have a pleading, helpless look on their faces. How does diet affect urinary stones? Note: It’s very important for vets to determine the type of stone an animal has before changing their diet because foods that treat struvite uroliths can increase their risk of developing calcium oxalate uroliths and vice versa. If you change your animal’s diet in order to treat (or prevent) bladder stones, have their urine tested several times a year to make sure their new diet is working and isn’t causing other problems. Dietary treatments of urinary stones are designed to alter their metabolism, change urine pH, increase water intake/thirst, and increase the activity of enzymes that break down urinary minerals. Photo courtesy of Magic Madzik. Some prescription diets available only through veterinarians have ingredients that cause mineral stones to dissolve without medication or surgery. These foods also contain more salt, prompting animals to drink more water and flush out the bladder. Many such foods are intended to be temporary, short-term diets because they are not complete and balanced. While on these diets, an animal’s blood should be monitored to ensure there are no side effects from the restricted proteins. Non-prescription diets for dogs and cats with calcium oxalate uroliths or urinary tract infections generally are higher in minerals (like salt, magnesium, and phosphorous), higher in moisture, lower in protein, and use premium protein sources. Diets for struvite stones generally have normal levels of minerals, are higher in moisture, lower in protein, and use premium protein sources. Making sure animals do not have excess vitamin C and D also decreases the chances of bladder stones forming. It’s also a good idea to avoid ingredients that increase calcium levels, such as spinach, rhubarb, parsley, milk products, and table salt. Note: table salt is sometimes listed as “natural flavor” in ingredient panels. Veterinarians might also suggest using supplements that are rich in antioxidants and essential fatty acids, which help maintain a healthy urinary tract. Look for foods that contain premium protein sources that are rich in essential fatty acids such as salmon, venison, brushtail, kangaroo, and freshwater eel (unagi). These days, many pet foods also include antioxidant-rich ingredients like cranberries, blueberries, and seaweed. Raw and raw dehydrated foods are processed gently, so they retain amino acids, essential fatty acids, and antioxidants better than canned food and dry kibble. It’s also extremely important to make sure animals prone to urinary stones have plenty of moisture in their diet and that they’re drinking plenty of water to continuously flush out the bladder and make it less likely for uroliths to form. How are urinary stones treated? Antibiotics if an animal’s urine culture indicates that bacteria caused the stone to form. Medications that alter urine pH. Fluid therapy if the pet has kidney disease, a urinary obstruction, or is dehydrated. Flushing stones out of the bladder using sterile saline. Chiropractic techniques that stimulate the nervous system in ways that increase urine output and increase blood flow to the kidneys. How are urinary stones prevented? Preventing urinary stones from forming is just as important as treating existing stones. Many types of stones can be prevented simply by changing an animal’s diet, while other types of uroliths require long term medication. Making sure a pet always has access to fresh water and a place to go to the bathroom is critical for preventing urinary stones. Even if they rarely drink water, having it available will help you gauge when they have increased thirst. That’s a symptom that will provide a good clue for your vet. 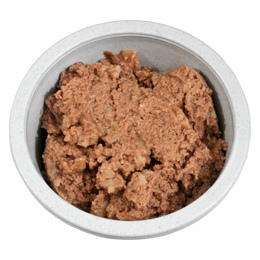 Feeding wet and raw food diets, which have more moisture than dry kibble, is also very helpful. Messonnier, Shawn. “Bladder Stones.” Natural Health Bible for Dogs & Cats. New York: Three Rivers Press, 2001. Pitcairn, Richard. “Bladder Problems.” Dr. Pitcairn’s Complete Guide to Natural Health for Dogs & Cats. New York: Rodale Books, 2005. Zucker, Martin. “Kidney and Urinary Tract Conditions.” Veterinarians Guide to Natural Remedies for Dogs: Safe and Effective Alternative Treatments and Healing Techniques from the Nation’s Top Holistic Veterinarians. New York: Three Rivers Press, 2009.